Point Farm Barn01263 715779work01603 870304fax Self-cateringPoint Farm Barn is a converted late 18th century red brick barn retaining many of its original features which compliment its modern renovation. • General: Underfloor O.F.C.H and Multifuel stove. • Utilities: Electric hob and cooker, fridge, freezer, microwave, washing machine, dishwasher. • Beds: 2 King-size, 4 singles. • Other: Towels, Books, Games, Stairgate, WiFi. Travel cot. • Outdoors: Fully enclosed patio, open lawn garden, garden furniture and barbecue. 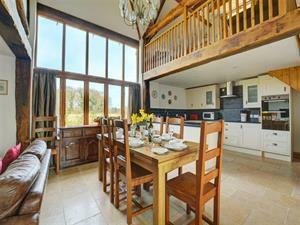 Point Farm Barn offers weekly bookings starting on Saturday. Point Farm Barn is a converted late 18th century red brick barn retaining many of its original features which compliment its modern renovation.